San Francisco Mime Troupe has received a NEA Grant for “Walls” their summer Musical that runs July 1st to September 10th. The troupe has been providing free Musical Political Theatre in the Bay Area Parks for 58 years. “Walls” asks the question: How can a nation of immigrants declare war on immigration? The answer is Fear. “Walls” is about L. Mary Jones (Velina Brown) who knows all about fear. As a top agent for I.C.E. (Immigration and Customs Enforcement) she knows how to stoke fear to keep her country safe. Fear of people like Bahdoon Samakab (Rotimi Agbabiaka), a Somali refugee escaping oppression, fear of Cliodhna Aghabullogue (Lizzie Calogero), an Irish woman yearning to be American & fear of Zaniyah Nahuatl (Marilet Martinez), whose family comes from here. As a foreigner in a land her people have worked for thousands of years suddenly Zaniyah is a criminal, an illegal, a "bad hombre." What part of herself will this American give up to pass as "American?" Will she? Can she? Should she? Can someone leave part of themselves behind without losing their mind & is it better or worse that she crossed the border to find Agent L. Mary Jones - the woman she loves? 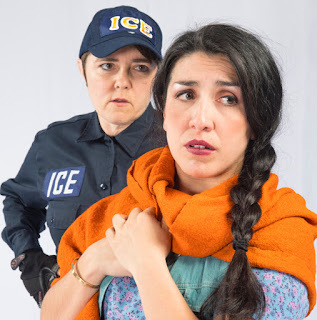 It seems even Breitbart News caught wind of “Walls” stating “A San Francisco musical about a criminal illegal alien lesbian with mental health issues who is in love with an immigration agent." “Walls” is written by Michael Gene Sullivan. Photo by David Allen.